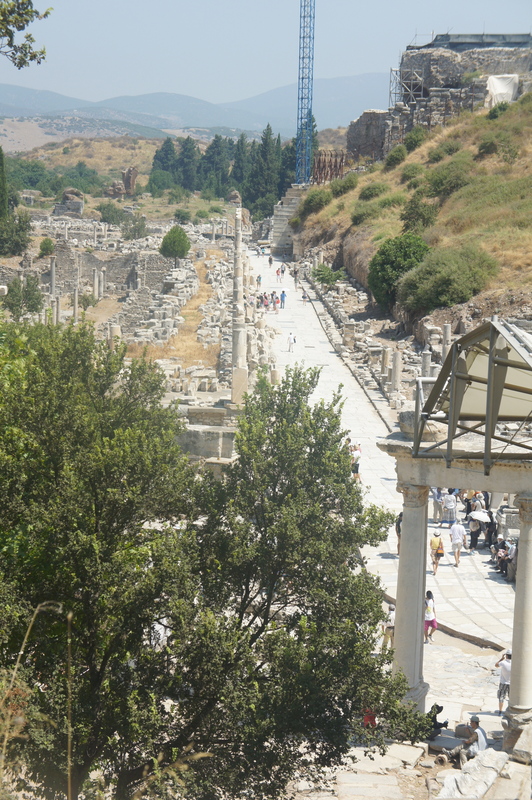 The main street of Ephesus. When you ask kids what they want to be when they grow up most want to be rich, ballerinas, firemen, actors, policemen or something equally exciting. Of course a lot depends upon gender influences. Me? I wanted to dig up Troy. The fact that it had been discovered and had already been dug up, being kind of ruined in the process, didn’t faze me a bit. What fazed me was when I learnt that to be a really good archeologist required a knowledge of Latin and a healthy smattering of Ancient Greek, and so my dreams came to a shuddering halt. I never thought I’d see Troy or Ephesus or Pompei. They’re places you read and fantasise about but you never, in your wildest dreams, expect to wander through their ancient streets, gazing at views that haven’t changed in thousands of years. Ephesus has increasingly become a must-go-to-see tourist attraction, which can be a monumental pain in the arse. It is not helped by bearing witness to what little remains of the Temple of Artemis, and street peddlers with signs that read “Genuine Fake Watches’. View of a part of Ephesus from the upper outside area of the villa currently being excavated. You can see a crane working on the arena in the distance. His Nibs and I were most fortunate in having a personal guide, Nurdan, a retired curator with the wonderful National Archeological Museum in Istanbul, who had worked on the site for nearly three years helping uncover mosaic floors. It was, for her, a labour of love. 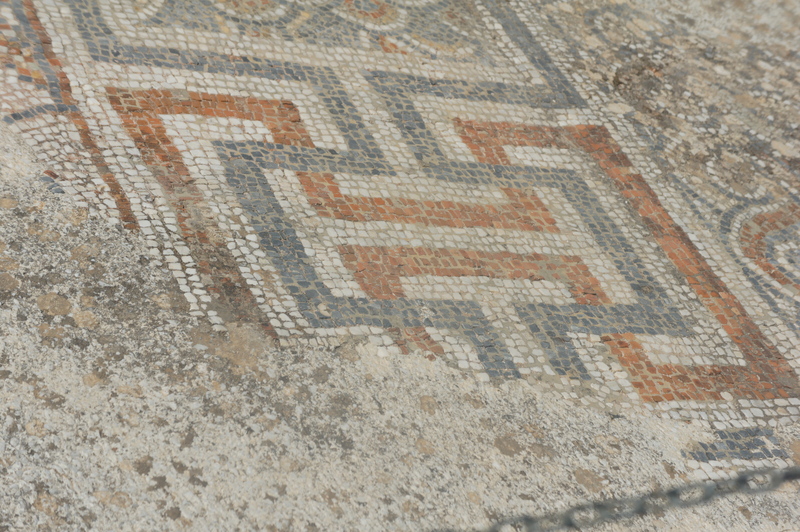 One of the mosaic floors recently uncovered with assistance of Nurdan, our guide, and located at the front entrance to the villa currently undergoing excavation. 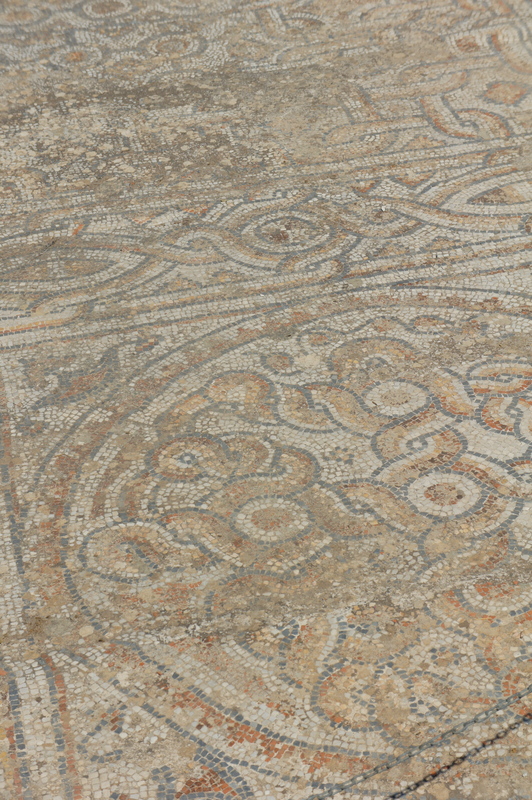 The other mosaic floor recently uncovered. Ephesus. Ephesus is famous as being; first, an ancient Greek and then a Roman city of distinction where sons of Roman noble families were sent for their education. Under the Romans in the 1st century BC the population is said to have been around quarter of a million, and close to 400,000 by 100 AD. The city had hot and cold running water via clay pipes that fit together like lego, and are seen in abundance everywhere on site. 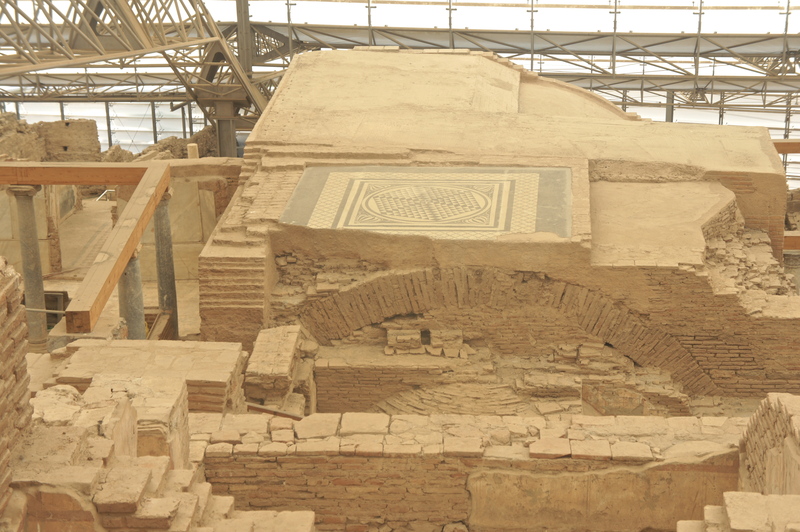 Fire ovens where water was heated have been found when excavating the bath-houses and those houses which had baths. They also used hot water for heating. Very civilised. Clay water pipes in situ. Ephesus. Excavations of nearby areas have unearthed artifacts from the Neolithic and Bronze Ages, meaning there has been some form of settlement here since approximately 6,000BC. This city was important during the Classical, Hellenistic and Roman periods. Its major temple, the Temple of Artemis, is deemed to be one of the Seven Wonders of the ancient world. It had been damaged and rebuilt a number of times, the last rebuild being completed in approx. 550 BC. The temple was subsequently destroyed by John Chrysostom in 401 AD during yet another period of destroying anything that smacks of paganism or heresy. He became a Saint. Whether this canonisation was because he destroyed one of the seven wonders or for other nefarious reasons I neither know nor care. May his relics be so scattered throughout the Christian world that it gives him no peace in his special after-life. The Temple of Artemis now boasts only one poor lonely column remaining. All other artifacts now reside in either the British Museum or the National Archeological Museum in Istanbul. The obvious destruction of the Temple of Artemis is a sorry start to the day but is soon catalogued somewhere in the back of your mind as Ephesus is amazing. 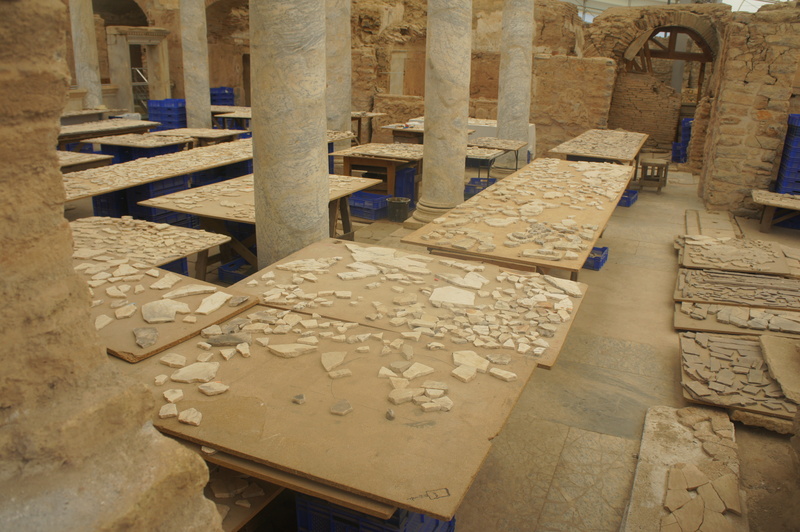 Interior of an on-going excavation of a villa. Ephesus. They estimate that nearly 20% of the city has now been uncovered. 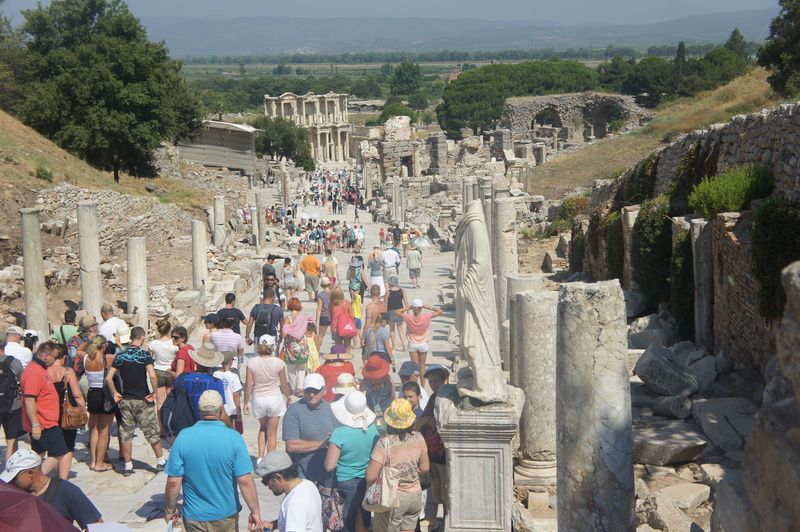 To be able to walk the streets of Ephesus as it is now is special. We were, however, fortunate enough to receive a special privilege of going through one of the homes that is currently being excavated. Anyone for some jigsaw puzzle practice? Work continues. Ephesus. They have carefully built a large tin shed around the villa that once took pride of place on the main street of the city. 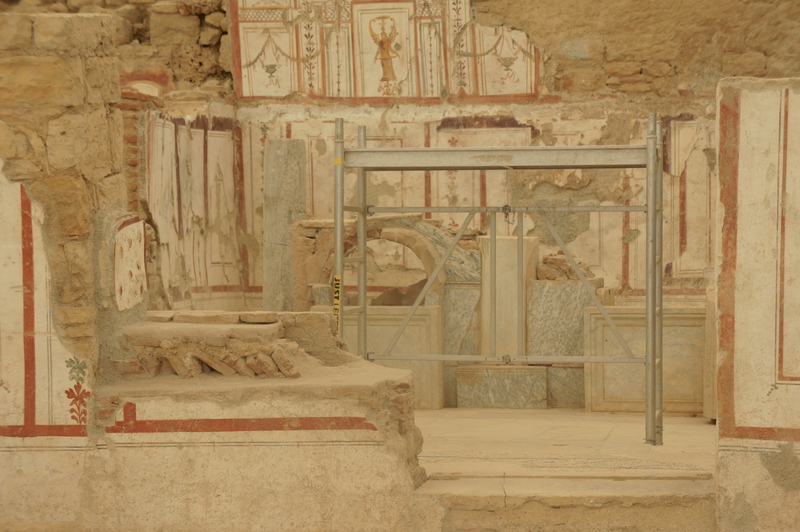 This allows those archeologists working on the site to continue working uninterrupted from either the thousands of tourists who visit or the weather, which can be daunting. 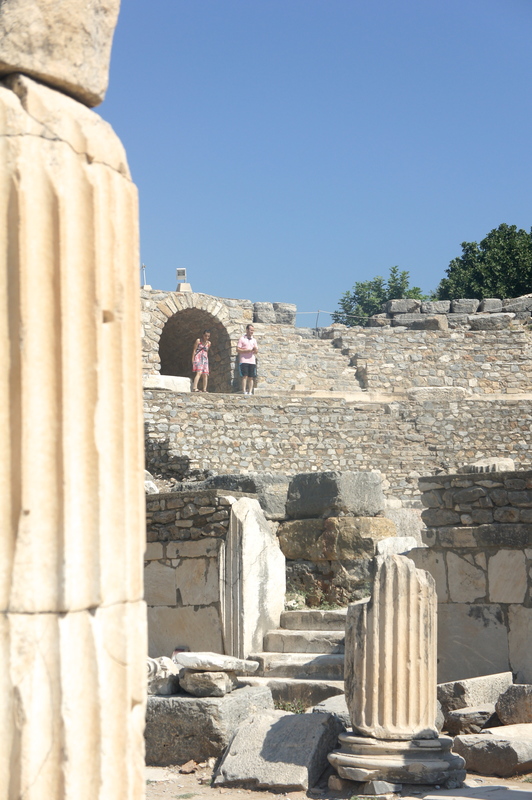 The day we visited Ephesus it was over 40C. Working in the direct sun would have been impossible. Fresco: a work in progress.. Ephesus. 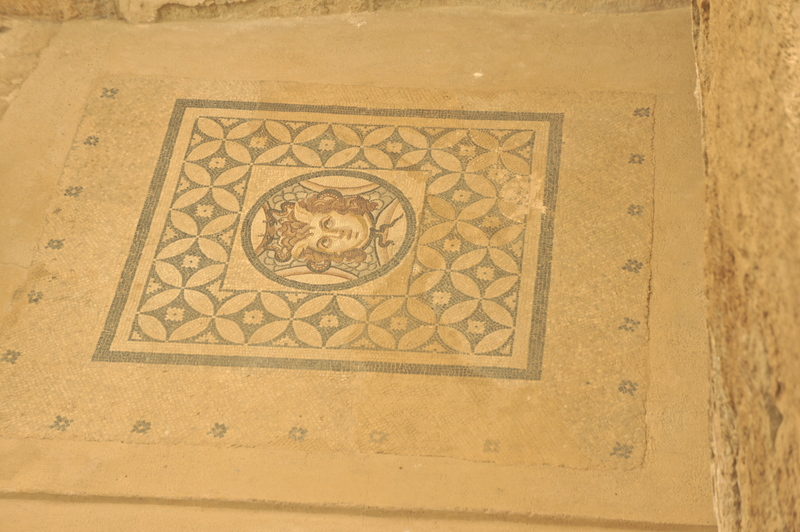 Mosaic floor in situ. Villa. Ephesus. We spent ages looking at what has been accomplished here. 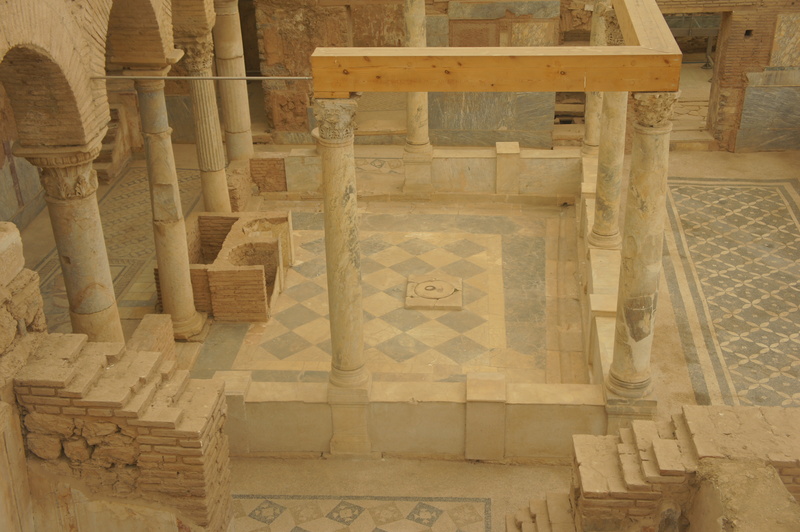 Floors have been uncovered, baths, huge ovens for heating water, as well as water and waste pipes – all gravity fed, ventilation shafts for the movement of fresh air, frescos, mosaics and artifacts of urns, statues: a treasure trove in comparatively good condition. Part of the bath. This villa had their own bath. Ephesus. 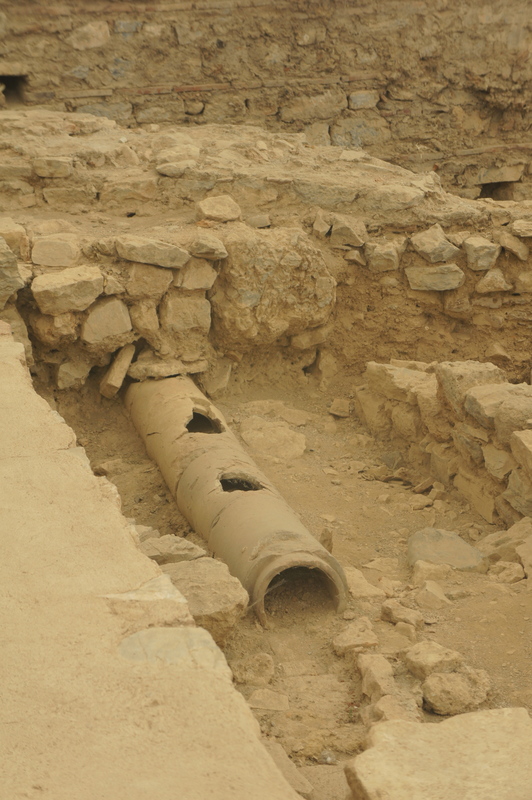 Water pipes uncovered and remain in situ. Villa. Ephesus. 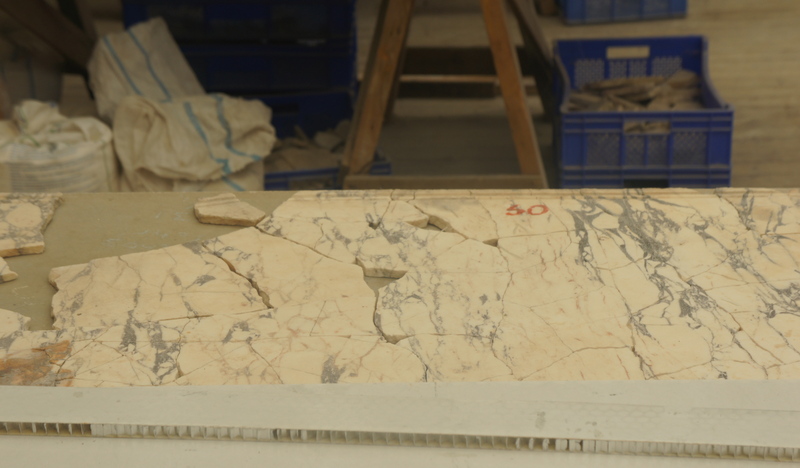 Large trestle tables are set up, one after the other, as pieces of marble, stone and tiles are uncovered. If you have a penchant for jigsaw puzzles there’s a job waiting for you here. The sub-floor engine room for the whole house includes pipes for running water, and ovens to heat water. Ephesus. 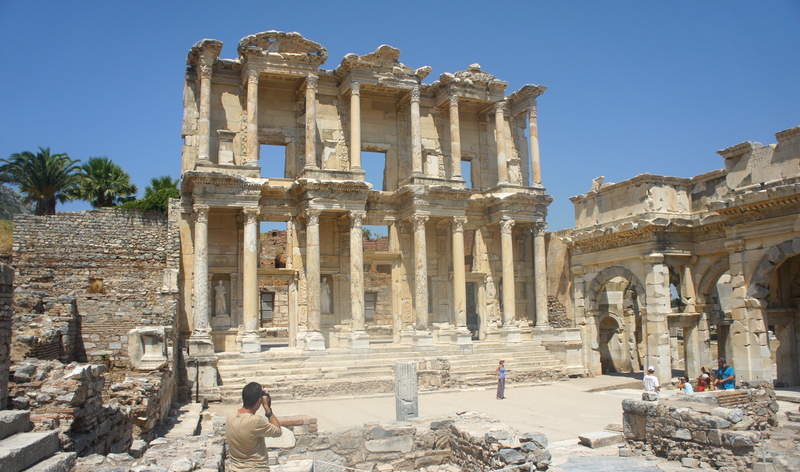 The other big ticket items of Ephesus are the Library of Celsus, which is a gobsmacker, and the main arena. The facade of the Library of Celsus is deliberately designed to create an optical illusion. The columns are tapered in such a way as to cause the observer to believe that the building is larger than it really is. It is quite a small building in fact although it is reported to have held over 10,000 “books”. 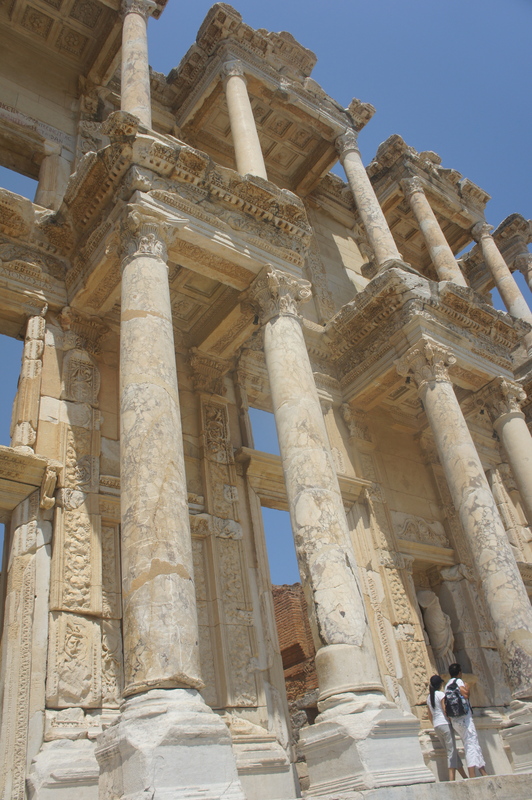 The facade of the Roman Library of Celsus. Ephesus. The Library was designed and placed in such a way as to maximise the amount of light entering, what the archeologists believe, were the reading rooms. As you reach the top of the stairs there are four fabulous statues. One being the namesake for our daughter I had to include a photo of course. I’ve also tried to take a photo which shows how the columns are tapered. I don’t think I succeed but it is included. for your perusal. 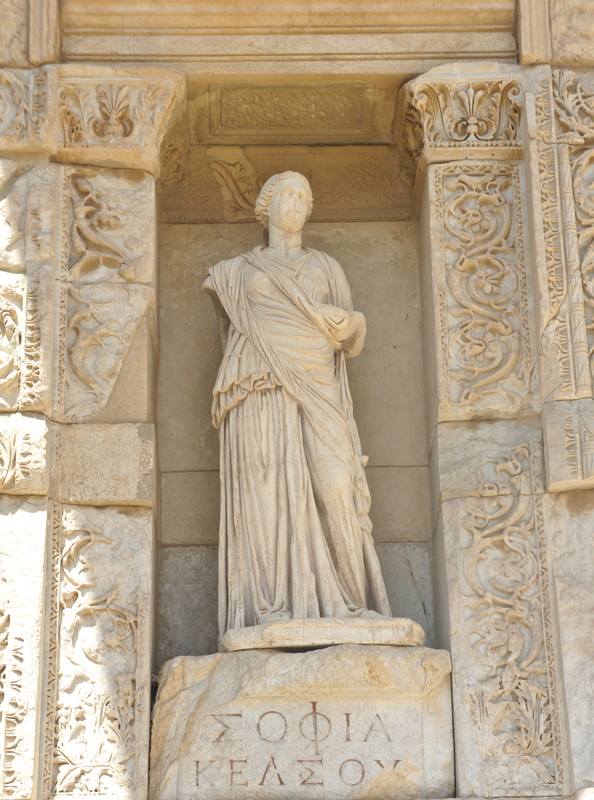 One of the statues that grace the front of the Library of Celsus at Ephesus. Her name is Sophia. The facade of the Library of Celsus at Ephesus. The columns are tapered creating an optical illusion that the facade is bigger and more imposing than it really is. As the Library dominates the walk down from the main gates, the arena becomes the focus of attention when you reach the end of the main street. They are currently working on it. A huge crane is required to replace the large stone blocks. Depending on who you speak to or what publications you read, the arena can/could seat 25,000 to 40,000 people. Either way it is vast. The controllers of Ephesus now light the city at night and I’m told it is spectacular. Now that would be a sight worth making a special return trip to see. The glorious arena of Ephesus. 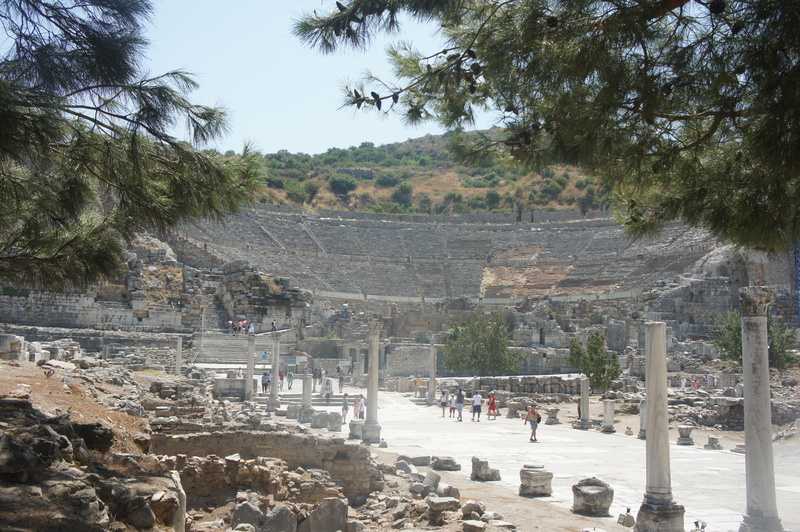 Posted in Food, Politics, Sport, Kitchen, Travel and tagged a bucket list item, Ephesus. Bookmark the permalink. Great photos. Ephesus is on my list of places to visit. Next year! I’m glad you like the Ephesus story. It is most definitely a must visit. You’ll not be disappointed. That was a wonderful guided tour and I am very impressed by the photos. I have questions, because I don’t know much about this site, my main experience being in Indian subcontinental sites like the Indus, and Chinese ones around Xian and down the Silk Route. Another time maybe. Thoroughly enjoyable! What I didn’t talk about is the current political situation in Turkey which has already had an impact on the site. 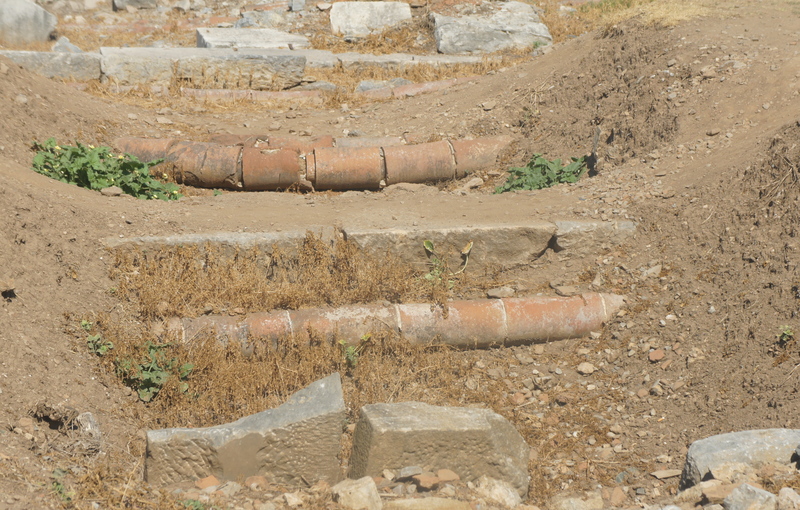 Both Turkey and Greece are facing problems which don’t just threaten the progress of excavation on their sites but their continued maintenance. It is a cause for concern. Glad you liked the post. I’m especially pleased with the photos as in some instances I was shooting blind. Love, Joan. I agree there would be nothing like a good archiological dig! I had read a little about Ephesus because my son, as part of his school studies, was to visit this ancient city the week after attending ANZAC Cove for a dawn service. Sadly the trip has been cancelled because of the ongoing conflict in neighbouring Syria but your wonderfully detailed account still makes it a must see.. One of the things that fascinates me, other than the simplicity of a water system and the breathtaking beauty of It’s architecture and artefacts , is what it can tell you about the people who lived there. Obviously people who liked to take a bath and read books in that amazing library featured in you photo gallery. It’s a wonderful tour. Thank You. That was wonderful. It is remarkable so much is still there. Thanks for the tour. Dear Anne, I’m so glad you liked the post on Ephesus. It will be interesting to go back to see how much more has been excavated. Best Wishes, Joan. You missed your calling, Joan. You are an outstanding tour guide. It never ceases to amaze me how much alike ancient man and modern man are. We think we have made such marvelous advances, yet ancient man had running water, heated water, baths and kitchens that rival ours today. Dear Roberta, Put it on your bucket list. You’d love it as well as the food. It ticks all the right boxes. Thanks for the comment and the support. Best Wishes. Joan.